and at the same time offers everything! Clear sandy beaches, sun-lighted pebbles, museums, cultural festivals throughout the year and traditional local products of superior gastronomy. Tinos Island has a harbor, a heliport, a health center, a super market and plenty of restaurants and shops to make the stay of the most demanding visitor pleasurable, comfortable and safe! The bay of St. John Porto - 6km east of the city - is one of the most popular and visited beaches of the island. It is a large golden-sand beach with crystalline water, organized with umbrellas. A number of cafes and restaurants are within easy access. This pebbled beach with natural shade from pine trees is one of the better known and popular beaches of the island. At Kionia, you can swim under the watchful gaze of the god Poseidon as his temple dominates the region. After a dip, you’ll be spoiled for food choices as there are many picturesque taverns in the area. A sandy beach with emerald-green water, it is ideal for those who want to be far from the madding crowd and who are seeking tranquility. Make sure you are prepared with food and water before you get there as you won’t find any nearby. 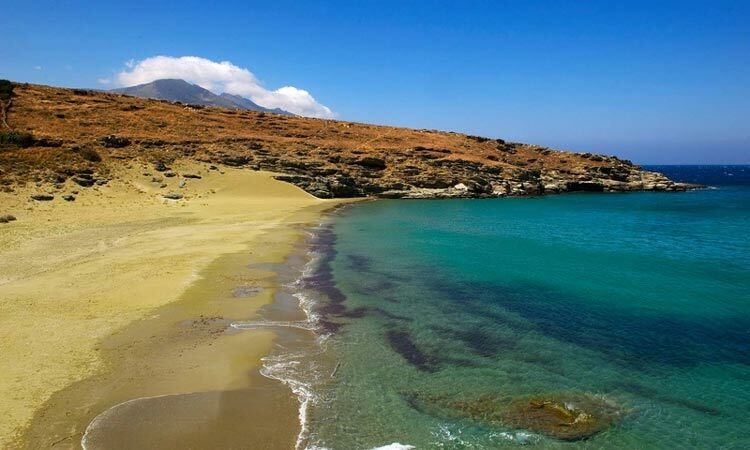 An isolated, crystal-clear beach that’s just 15 minutes away from Chora with blue-green water and golden sand that fully justifies its name that translates to “thick sand” in English. You won’t find lounge chairs and umbrellas, but there’s a café restaurant beside the parking area. 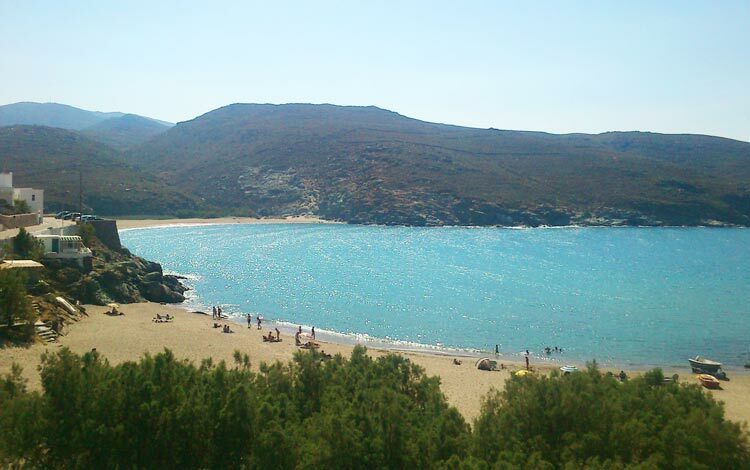 The largest beach of the island is a breath away from Chora. A beach for all tastes with sanded areas, pebbled sections or places with both, whereas pines generously offer shade. It is organized with umbrellas and sun lounges whereas you can find cafes, restaurants, beach bars and retail stores around the area. Tinos is an exceptionally fertile island famed for its local products and many gastronomical feasts. Produce includes barley, oats and wheat and the area is also known for its eclectic white wine. Livestock bred includes sheep, beef cattle, pigs, poultry and pigeons, so there is a wide range of local meat and cheese produced in the area. Definitely taste some of the local cheese, spicy gruyere and kopanisti. Don’t forget to have some louza (pork fillet baked in the sun), synglino (traditional pork meat) and pasta (salty meats). And finally, don’t hesitate to try amydalota (delicate crispy and chewy almond biscuits), pastelli (honey candy), lychnarakia (sweet made of cheese) and xerotigana (honey-dipped spiral pastries). Sightseeing that you should not miss! Volax (with the accent on either the ‘o’ or ‘a’) is a medieval village, built at an altitude of 284 meters on a small mountain range in the middle of the island. The main characteristic of the village are the boulders or the huge spherical granite stones of volcanic origin that surround the area, giving it a celestial feel. At around the Easter period athletes from around the world participate in bouldering, whereas paintball teams give another spirit to the area. The old trails and uniqueness of the landscape draw hikers from around the world. A Folk Museum works in the area, whereas a stone theater comes alive over the summer season with a smorgasbord of artistic events. The rock of Exombourg is at an altitude of 640 meters. It is a trademark landmark of Tinos and is visible to visitors from the port at Chora. The area is a natural fortress inaccessible from three sides that was used from the Bronze Age to protect the population of the region. In 1207, the high rock was fortified and a garrison was created to withstand centuries of attacks by Ottoman corsairs until it was ultimately destroyed by the Turks in 1715. The castle was named the “Castle of St. Helen” from the church built at its peak. It is unknown when they first started being constructed, though it was certainly under Venetian influence. One thing is for sure, these pigeon houses are an excellent sample of ingrained talent of Tinos workmanship. They are mainly two-storey stone constructions, monuments of unique folk creations. Created in full harmony with the environment, the pigeon houses of Tinos express a pure folk architecture. The use of fine slates and operational need for the construction of many small openings for the entrance and exit of birds gave folk artists the opportunity to create facades of remarkable variety and compositions of decorative details transforming pigeon houses from a simple nest to structures of distinct artistic value. At Kionia, 3km west of Chora, the temple of the god Poseidon and his wife Amphitrite is the sole temple throughout the entire Cyclades that is dedicated to the gods of the sea. Epigraphs and historical commentaries show that Poseidon was worshipped as a therapists and Aphitrite cured female infertility. Built using the Doric rhythm, austere and meticulous, the temple has some original features such as the fountain platform designed by its creators from Tinos. Constructed using gneiss and marble in various hues after sculptors from different areas were called to create it, whereas Andronikos of Kyristos created a famous sundial which is now exhibited at the Archaeological Museum of Tinos. Yiannoulis Chalepas was a symbolic figure in contemporary Greek art and certainly the most important representative of sculpture. The son of a wealthy family of marble sculptors from Pyrgos (Tower) in Tinos and the creator of the famed “Sleeping Girl” that adorns the grave of Sofia Afendaki at the First Cemetary of Athens, Yiannoulis Chalepas preoccupied people with his life as well as his work. His family home at Pyrgos has been converted to a museum where the visitor has the chance to see his personal items, family photographs, hand-written notes, furniture, household utensils, the artist’s own blueprints and sculptures, his tools and his workshop. 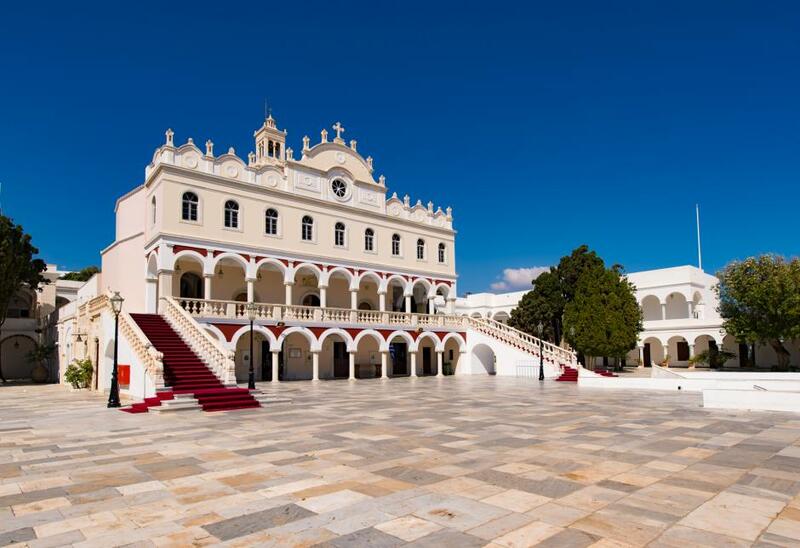 The Holy Church of Evangelistrias (meaning “All-Holy Bringer of Good News”) and also known as Panagia (Our Lady) of Tinos, is undoubtedly one of the major attractions of Greece. It’s importance as a church is independent from its religious identity as the Holy Church is also a marvelous architectural landmark of great national and historical significance. Its construction began in 1823 at the point where the icon of the Annunciation of Our Lady and was completed in 1880. The icon of the Virgin Mary is considered miraculous and draws thousands of believers from all parts of the globe each year as they come here to fulfill a tama (vow) or to receive her grace.